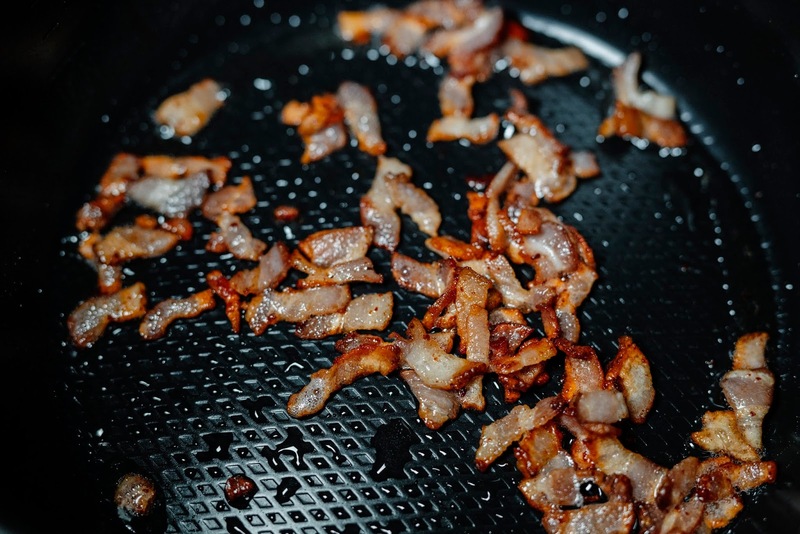 I started with a couple strips of bacon to add a little flavor and serve as my fat for sautéing the vegetables. If you don't eat pork, or you'd like to keep the calorie count even lower, then you can simply omit and sub with 1-2 tablespoons of olive oil. Just set your multi-cooker to the "saute" function and fry up the bacon pieces until almost crispy. Justin patiently took photos of each step of this process, like he always does, but in the end I realized it was just a bunch of photos of me dumping things into the pot, which is completely unnecessary. 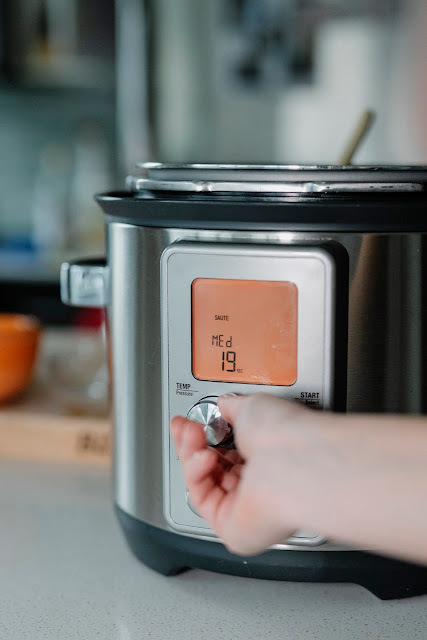 Just know that this recipe is suuuuper easy and mostly involves throwing everything into your pressure cooker. 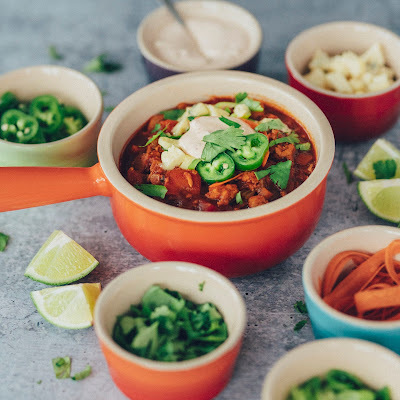 A couple other "Jaymee additions" to this recipe are tomato paste (in place of sauce) and chipotle chiles in adobo sauce. 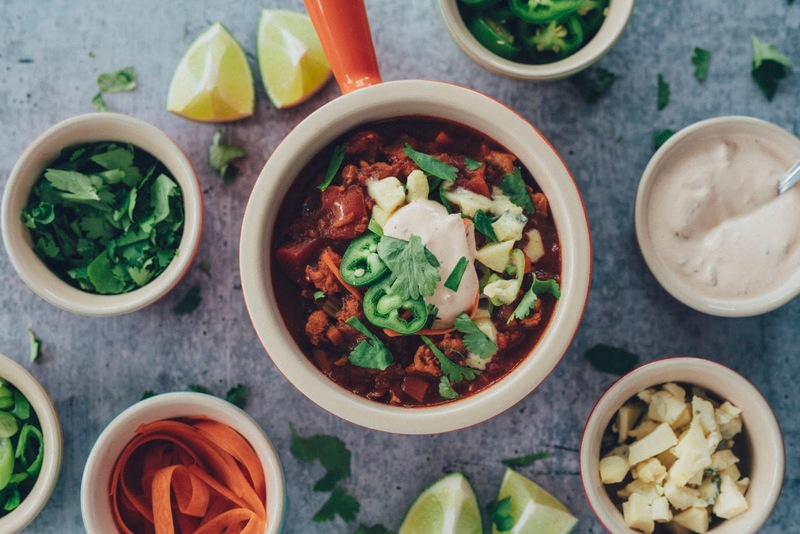 I love the umami flavors of both in chili, so I wanted to incorporate into this recipe as well. Because I only need a little from each can and I hate wasting things, I like to freeze whatever I don't use in silicone ice cube molds, and then transfer the frozen cubes to freezer bags for future use. 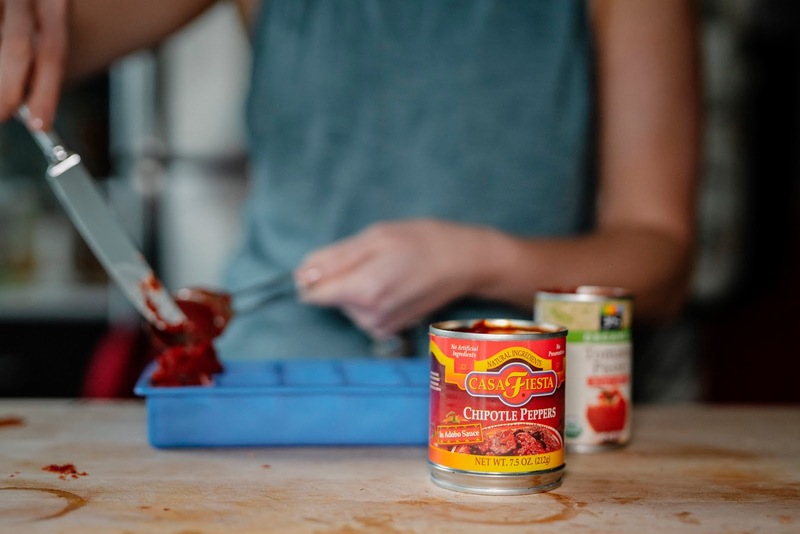 To do this, I measure out about 2 tablespoons of tomato paste for each "cube" and one chile pepper with adobo sauce per cube... that way, they are pre-portioned and ready to go in a future recipe! 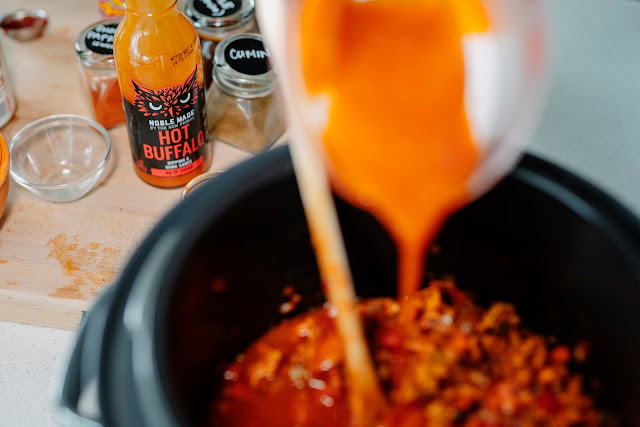 Perhaps the most important ingredient in giving this recipe its signature flavor is Buffalo sauce. I have become sort of obsessed with the New Primal Buffalo sauce, and it comes in three different heat levels (mild, medium and hot.) It also has no added sugar, so it is perfect if you are sticking to Whole30, paleo or keto diets. I also really like Frank's Red Hot Wing Sauce. Whatever you go with, I would recommend a more prepared "sauce" over a hot sauce. 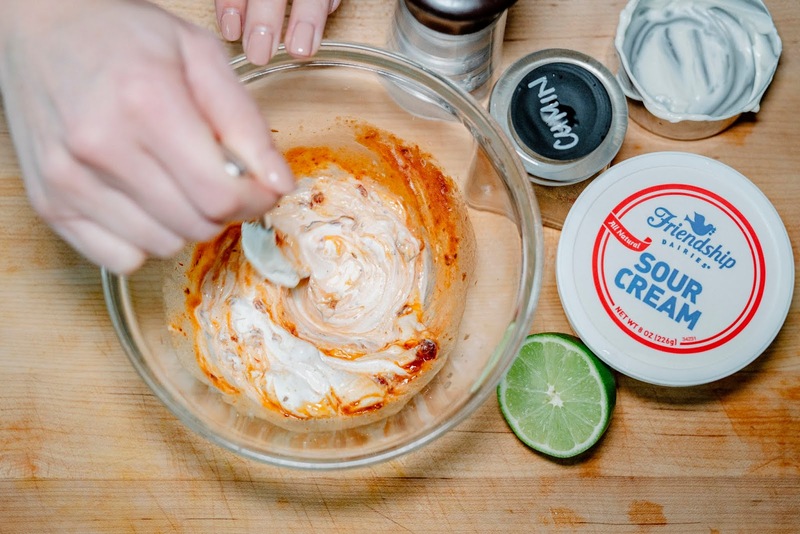 While chili is cooking, whip up a quick chipotle lime crema. It's literally just sour cream (or creme fraiche or both), along with some lime juice, a chipotle pepper in adobo sauce, a touch of cumin and salt. I love mixing this into my chili, or as a topping for tacos! Cover and refrigerate until ready to use. After it finishes releasing the steam, I add the beans and reduce the sauce to help thicken it up a bit. (There's an an actual "reduce" function on the Breville... on an Instant Pot, you can just use the "saute" function with the lid off to reduce to your desired thickness.) 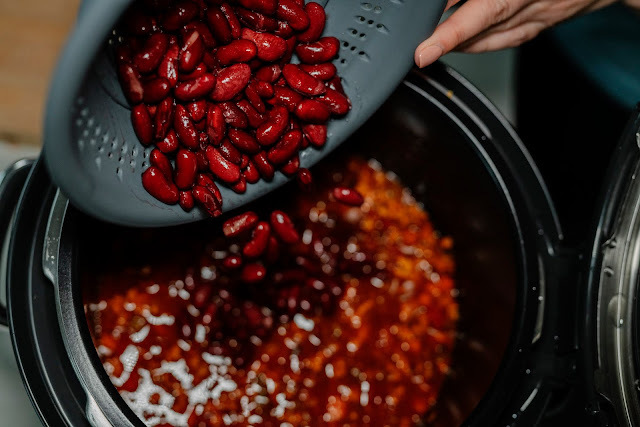 If you are doing Whole30/Paleo/Keto, then skip the beans and just go straight to reducing the chili. Ladle into bowls and garnish away! Definitely don't skip the blue cheese crumbles, as it adds to the Buffalo wing flavors (unless of course you're doing Whole30 or Paleo or you don't like blue cheese.) I also did sliced jalapenos, cilantro, green onions, lime wedges and carrot ribbons. I think avocado would be a nice add-in as well, but I didn't have any on hand. What's your favorite kind of comfort food when you're also trying to eat healthy?! I would love to know in the comments section! Set your pressure cooker (or instant pot) to "sauté." Once hot, add bacon (or olive oil if not using bacon.) Sauté until bacon is starting to get crispy. 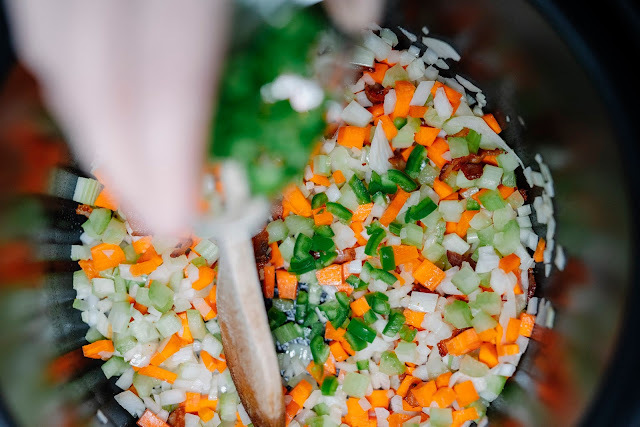 Add onions, carrots, celery and jalapeño peppers. Sauté for 3-4 minutes, or until just starting to get soft. Add garlic and cook another 60 seconds. Add paprika, chile powder, cumin, tomato paste, and chipotle pepper and stir. Cook a couple more minutes to eliminate the "raw" taste from the spices and paste. Remove the bay leaf, stir in the drained beans and set pressure cooker to "reduce" or "saute" depending on the model you are using. (If you used chicken breasts or thighs, remove and shred with two forks and return to pot.) Reduce with lid off for 5-10 minutes, or until chili is desired thickness. Taste for flavor and add more wing sauce (or salt & pepper), to suit your preference. Ladle into bowls and top with desired garnishes, such as: blue cheese crumbles, cilantro, green onions, jalapeños, carrot ribbons, avocado slices, lime wedges, sour cream or Chipotle Lime Crema, recipe follows. 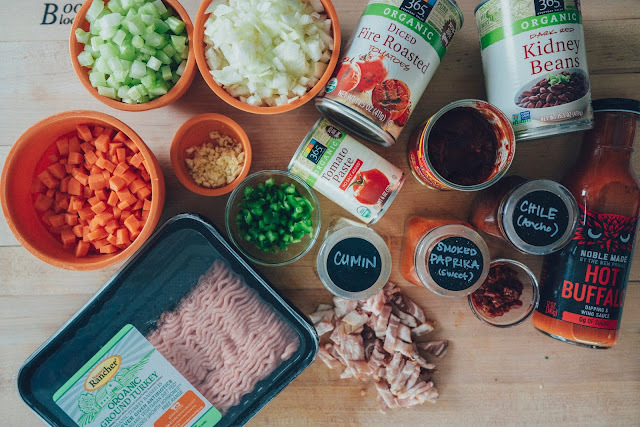 Mix together all ingredients and refrigerate until ready to use.